The new Eastern span of the Bay Bridge opened among fanfare and stirring controversy on September 3rd, 2013. Being a commercial photographer I’m more interested in the the visual aesthetic than the technology behind this engineering marvel of a bridge. 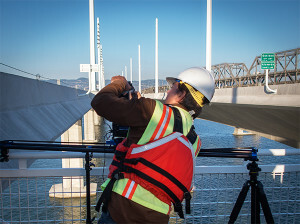 I was fortunate to engage both of these parts (architectural photographer and timelapse) a few days before the Bay Bridge opened to the pubic, while shooting a San Francisco-Oakland Bay Bridge Timelapse video for the Caltrans Bay Bridge film. All suited up in safety gear I ran two different three axis six foot timelapse rigs for several hours to capture two day-to-night timelapse sequences illustrating the architectural LED lighting on the bridge. Fortunately these once in a lifetime timelapse photography opportunities are not as taxing on my nervous system as they use to be. Shooting day-to-night timelapse movies of the San Francisco-Oakland Bay Bridge. The artisan Bay Lights project has received tons of press, but the LED lights on the new Eastern span are no less. These are the latest in modern LED architectural lighting design. This is by no consequence either. Saeed Shahmirzai is the lead engineer for both projects. With 48,000 individual LED’s it’s rather stunning to see the first time. Motorists will appreciate the pre-aimed computer aided lighting design, where all the lamp heads are directed forward of the driving direction, so there are no bright lights in a drivers eyes. As a San Francisco based architectural photographer and filmmaker, I’m super keen on the clean daylight color balanced lights, which makes for many cleaner looking time lapse photography results to come.